I usually eat mine. but you’re right. I made these for a family picnic/get together. I had made one batch for this occasion which totaled around 55 balls. I made some with almond bark and a few with dark chocolate baking squares (which required refrigerating to harden) and came home with exactly ZERO!!! You would think I would be disappointed about not having any more to eat when I got home, but really, I’m not!! Mainly because if I had brought them home, I would have eaten them ALL!!! I will have to make these again, I’m sure. 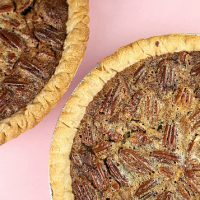 Only, I think I might have to try german chocolate with the pecan/coconut frosting dipped in almond bark and rolled in a pecan/coconut topping…yup, mouth is watering already!! Thanks for sharing your recipes and ideas with all of us! Mel – my mouth is watering too! Sounds good even though I’m not a big fan of coconut. I am planning on making these for my cousin’s baby shower. She is having a little boy so I thought about dying some of the chocolate blue to decorate the cake balls once they dry. 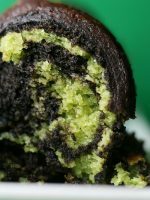 Is regular food coloring okay, or do I need a different type? Amanda – did you use chocolate bark or candy melts. Or did you use baking chocolate? When I dip, I drop them in a bowl of melted chocolate bark one at a time and then lift the ball out with a spoon. Then I tap it several times on the side of the bowl to allow the excess chocolate to drip off. And, last, I let the ball slide off the spoon onto the wax paper. I still get a little bit of pooling though, but not too much this way. I think that maybe that chocolate I used was too thick. What kind to you recommend, I am definitely going to try again! 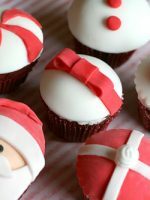 What do you use for the cupcake shaped ones? bakerella …. i’ve seen a cake balls before …but these are extraodinary with red velvet cake !!! .. hope u dont mind sharing the idea :D .. i will try to make this with my 13 yrs old daughter .. she’ll love it …. TFS…. Vee Cross site – If you’ve made them before, then I think you’ll love theme with red velvet. You’re on the list for next year!! Good idea though about the different flavors–even white and chocolate outer coverings would be pretty. I have read through some other comments now and have all sorts of combinations to try. EVERYONE is asking for the recipe—so I have forwarded on you website. Hi. I am planning to make these this week for my office’s indoor summer picnic. My mom used to make candy from time to time. I thought I would pass this along to everyone here and hope it helps. You can buy a special gadget that is used by candy makers for dipping. I think it is called a dipping spoon. It looks like a the frame of a spoon without the bowl. It allows the excess chocolate to drip off and there is no rolling around in the chocolate which should help to keep the cake balls together. Also, you can buy candy chocolate instead of the chocolate bark. It has a lighter flavor and comes in a multitude of colors. You can get it anywhere they sell Wilton products (like Walmart). Good luck and Thanks Bakerella … I am glad I stumbled onto your site from Yahoo!.  loriashely – I’m glad you stumbled, too. Thanks for sharing your tips. How sweet these look.. I have the cake in the oven. Surprised I was able to find a mix here in Idaho, but I did!! I just hope I can do the “dipping” I have not had lots of success at that in the past.. I bet you’ll do fine Elaine! Happy dipping! First of all THANK YOU SO MUCH for sharing this wonderful recipe. I’m Mariela from Puerto Rico and last week I tried the cupcake pops for the first time with satisfactory results. I’m starting in the cake business and I though they would be a good idea for party favors like, showers, bithdays, weddings, etc. here in Puerto Rico. I brought them to my work and they were a huge hit with rave reviews. My question is what would be the price of each pop? or should I sell them by dozen? I need an idea of the price. I loved the finished work and they are so Yum. I made them with homemade cream cheese frosting because I don’t like the store one. Mariela – I’m glad you like them so much. My best advice on the pops would be to break down your cost per pop with all the ingredients you use. 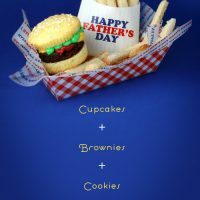 (cake ingredients, chocolate, sprinkles, packaging, lollipop sticks, etc.) And then charge enough to cover that plus your time/effort. And you may want to require orders of 24 or more. 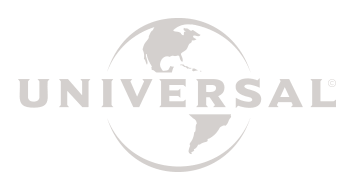 Where do you buy all your ingredients from? I’m a beginner, so i’m not too sure where to buy all those things. They look great, i can’t wait to try! Nana – I can get everything I need at Kroger. Including the chocolate and white chocolate candy coating/bark. 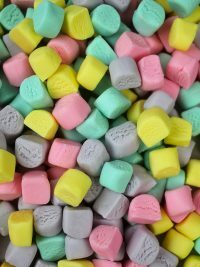 But, if I use colored candy melts, I get them at hobby lobby or at a local cake decorating store. pieceful bits – I guess you’ll have to make some more so you can enjoy. How wonderful! I finally got around to making these, and they are a hit! I’m definitely going to try other flavor combos. Thanks for the recipe! Here’s my blog post about the ones I made. anonymous – you can either pour your melted chocolate into a plastic squeeze bottle or pour some into a ziploc bag and snip off a corner to drizzle. Hi – my sister and I have made this recipe twice now. Once w/chocolate cake and dark chocolate dip, and now with red velvet cake and vanilla bark dip. Both times we’ve run into a snag when it comes to the coating – we can’t figure out a way (and trust me, we’ve gotten creative trying different methods) to get the truffles to really look smooth and beautiful like they do in all the internet pics we’ve seen! What is your technique? Just rolling it around in the dip? We’ve been getting excess chocolate/bark that leaves a puddle around the ball when it dries. We’ve also dipped plastic forks with the middle prongs cut out but that didn’t give us a smooth result either. Are we just far less talented than you, or this there some trick we’re missing??? Thanks in advance!! I made these in March with Ghiradelli chocolate. They were very good but a little sweet and I didn’t have enough chocolate. I just made them with white almond bark. The bark got hot as the dickens but never got thin enough to make them look pretty. I had them sticking to the spoon and creating suction. This took off some little crumbs when I dropped them off the spoon. Since it didn’t melt to a thin enough texture, I had too much on each ball. Again, this made it too sweet. I didn’t have enough to do a whole batch, so some of them just have a little dab on top. That ended up being just right. I have yet to do them with red velvet but devils food and regular chocolate are pretty tasty. I think I going to try the real recipe one time before I give them away to anyone for any occasion. However, I do enjoy my mess-ups…maybe a little too much. Oh…and I also used a pastry cutter to mix the cake and icing. CEB – I place the ball in a small bowl of candy coating. And I use a spoon to completely cover the ball and then remove from the chocolate. Then I tap the spoon on the side of the bowl to allow excess chocolate to fall off. Then let covered ball slide off spoon onto wax paper covered cookie sheet. Laura – try the dipping method I mentioned to CEB. You can also thin the chocolate with a drop or two of oil. Or you can buy paramount crystals. I can't wait to try these. At my work, we draw names for birthdays, & the person I drew loves red velvet cake, so she'll be getting the gift of red velvet cake balls! You are so clever! Thanks for sharing a great recipe. I made the “Happy Face” cake pops but had trouble drawing the faces on them with the Wilton Edible pens. I used yellow Wilton candy melts but the pens just wouldn’t write on the smooth, dry candy coating. They are brand new pens I just bought today. Any suggestions? kimag99 – She’ll be thrilled. anonymous – I use these black ones by Americolor and they work great. and here’s the whole color pack. These are great! I only needed 1/2 can of the frosting and I made them into lollipops. The kids had almost as much fun as I did. I can’t wait to make more already. I did it! I made the red velvet cake balls. They turned out great. I presented them as a birthday gift to my co-worker in a pretty bowl, & she was tickled. Of course, she shared them, & everyone said they were delicious & just as cute as can be. Thank you for sharing the recipe & technique. very clever and original idea!!! I would love to try to make them but I can’t find the can of cream cheese frosting and red velvet cake mix :( in my country. what else can I use?? kimag99 – YAY! I love it when people have success. Elke – you can use any flavor frosting and cake combo that you would like. 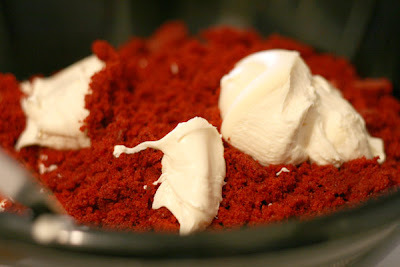 If you use red velvet, you could go with homemade cream cheese or even regular buttercream. So many people are having difficulty with finding the red velvet cake mix. I’ve made the recipe with a triple chocolate cake mix/milk chocolate frosting and again with a white cake mix/cherry frosting. Both turned out delicious! The cherry ones I divided and dipped half in chocolate and the other half in white chocolate – couldn’t decide which I liked better because they were both so yummy! 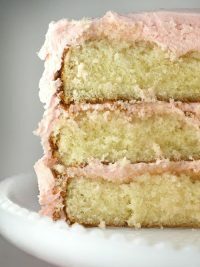 I think my next attempt will be a lemon cake mix with cream cheese frosting and dipped in white chocolate. Also, I didn’t find the balls to be sticky or messy to work with. I refrigerated the cake/frosting mixture for just a short time and then used my teaspoon scooper that I use to make cookies. I never had to touch the dough and my balls were perfect and uniform. Go katherine – glad you had success. I tasted these at a wonderful little restuarant in Nashville back in May and have been craving them ever since. Thank you so much for the recipe! I’m making them for a church potluck today! You’ll love them. Make enough to keep for yourself. I’m a big fan of Red velvet cake but unfortunately here in london only one bakery sells them and they pretty expensive. 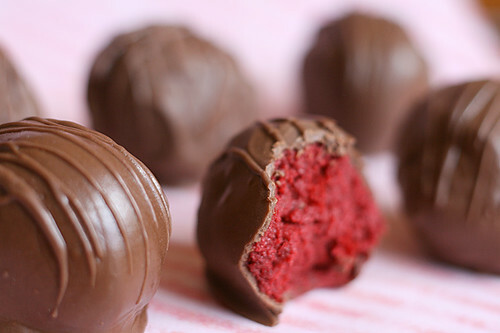 I love the red velvet balls, they look fantastic and bite size but the problem is i cant get the red velvet cake mix, frosting and chocolate bark here. So i’ve decided to make the cake from scratch(any good recipe site?) Making the frosting using the recipe from Martha stewart’s site. Will it work with normal chocolate? This is my main problem. Plus, all your stuff are fanstatics, cant wait to try the ores and cupcake pops. A good substitute for most of the ingrdient will be very helpful. You can use any cake or frosting recipe you like. Or any cake mix and canned frosting you like. When mixing, start out by not using the entire amount of frosting. You may not need it depending on the amount of cake you have. It should end up being moist enough to mold and hold its shape. I did it! and first attempt too, very pround of myself. I was able to buy betty crocker vanilla icing here, so i only had to make the velvet cake from scratch. I was scared about the dippin but had no trouble at all. It turned out fabulous and taste great. Gonna try the cupcake pops next. 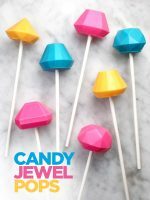 Is it ok to change the colour of the candy melt with food colouring? anonymous – Great!!!!! And, yes, you can change the color, but your food colorings cannot contain any water. You’ll have to find some specific for candy making. Glad you enjoyed the pops. wow. what great ideas for a special dessert. I am going to make birthday cake balls for my daughter. I will subscribe to your blog.  Sandy – I hope they are a hit. OMGoodness! 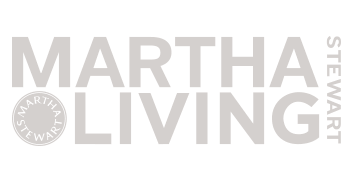 I came across this blog by mistake and boy did I stop in my tracks – so to speak! I ran out and made chocolate and strawberry cake balls and I can’t keep them in the house long enough to enjoy. I am trying to make several flavors and bring them to a christening on Sunday. Not sure if the kids will let me – may not be any left! cheri – that’s it. there’s no turning back now. You’ll be getting requests for these all the time. Hi Bakerella, instead of using cream cheese frosting can I just use regular cream cheese? I am going to use orange supreme cake with a little more orange color and dip them in chocolate for Halloween. Thanks for a gret idea. Corina – you could try it, but the recipe is meant to use frosting… it can be any flavor though. I use the cream cheese to make oreo truffles. SueLynn – Sounds like a great idea. Can you use white baking chocolate or white chocolate chips to coat instead of the bark or melting chips? You can, but it won’t have the same properties. They are meant for baking and not coating, so they are more likely to melt on your fingertips when you hold them for more than a few seconds. I am having trouble with coating. I have been putting the balls in the freezer prior to coating. Once I coat, I have had a lot of trouble with cracking. Is that because they are too cold? And the other thing that I can get is a smooth coating.. Any suggestions? How long have they been in the freezer? They could be defrosting and getting moisture in your chocolate or either so cold that the temp reacts when placed in the warm choc. They only need to be in the freezer for a few minutes. Long enought to get them firm. As far as coating, read some of the previous comments. Basically, I tap the ball while it is on my spoon several times to help the excess chocolate fall off into the bowl. It creates a smoother finish at the same time. I am willing to try this out. 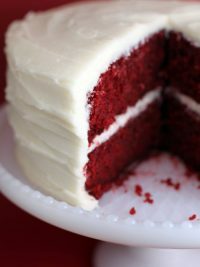 Do you recommend the Southern Red Velvet recipe that you have added? The only red velvet recipe I’ve ever done was from the Magnolia’s cook book. I didn’t make the red velvet, I made it with blue and had a few problems. It didn’t come out too great. So I think the red would probably be better. For the cake balls, though, the mixes are fine. 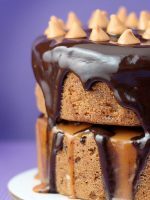 Then you don’t have to feel guilty crumbling up a beautiful homemade cake. So for your red velvet you use the ready mix ones? Here in London it’s so limited what you can find. They don’t have red velvet cake mixes nor the cream cheese frostings in packets. That’s why I have to do everything from scratch, which I don’t mind :). I’ll go ahead and try the Magnolia red Velvet recipe or something that doesn’t call for so much oil in it. What do you think? I didn’t realize you were in London. RV is hard to find in some areas of the US, too. I’m sure you’ll find a great scratch recipe. Let me know if it’s a winner after you try it. I’m trying these this weekend with spice cake and a white chocolate coating. not sure whether or not you’ll see this or be able to reply (so cool that you reply to your comments!) but I’ve accidentally left my balls in the freezer too long and am now wondering what I should do before coating them to ensure they don’t crack. fridge? counter? miss m – ok, good luck! And let them get back to a cold/firm stage. Also make sure your coating is melted but not super hot because that could make them crack if the balls are too cold and the choc is too hot. Good luck. So I made the spice cake/cream cheese frosting version and a vanilla cake/caramel frosting version. They both come out FANTASTIC! I’m coming home with maybe only 5! Hooray! What a hit! Yay! I’m surprised you had that many left. They sound great. I cann't get chocolate bark and candy melt, may I used chocolate coating? WOW! I don’t remember how I found your blog but I’m in LOVE!! My oldest dd turns 21 on Monday and I’ve been looking for something special to make for her! I’ll blog about them after I make them! 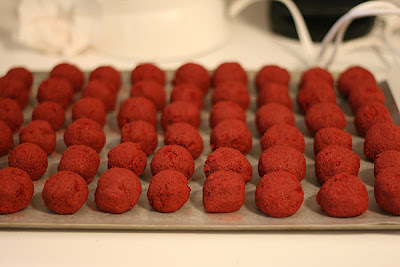 I am making the red velvet balls for a dessert contest at a party this weekend. I’ll let you know how it goes! 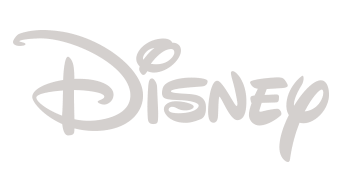 I’m addicted, I love your blog. 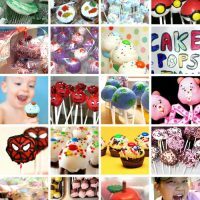 Question for you…how far in advance do you think I could make cakepops or cakeballs for a party? 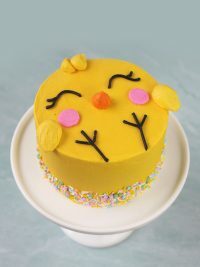 I have a question – and I hope you see this in time – I’m making these for my dd’s birthday. I baked the cake tonight and hope you can answer before I finish them up tomorrow. I couldn’t find the Chocolate bark here around me (went to 2 grocery stores)So I bought Baker’s Dipping Chocolate AND I bought Witon’s Candy Melts —which would be better to use? Anonymous – If your product says chocolate coating, that should work. It’s the baking chocolate that isn’t recommended. Anonymous – Without freezing, you can make them a few days in advance and leave them on the counter in an airtight container. I’ve eaten them up to a week later. You can also try freezing the finished product if you have to. 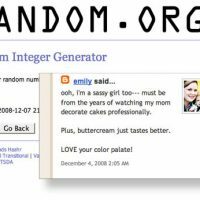 tidymom – I haven’t used these, but I think you can make either work. FYI, other readers complain about the Wilton being hard to work with. If you find it’s too thick or hard difficult, add a drop or two of veg oil to help thin it out before giving up on it. And if you end up using the dipping chocolate, let me know how you liked it. Good Luck. Hope your daughter has a great day! Read some of the comments on this post for tips on dipping. Thank you! You are AWESOME!! That’s one of the things I like so much about your blog! you take the time to reply to everyone! – I certainly didn’t expect such a quick reply!!! Thank you so much! I think I’ll go with the Bakers Dipping Chocolate – it comes right in a microwaveable bowl too! 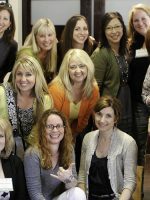 tidymom – They look great. Glad everything worked out. I’m sure your waitress was happy, too. Tried the recipe. Having two bowls of almond bark (a shallow one into which to drop the ball, and another from which to ladle almond bark on top), then using forks to roll the ball around keep the cake to a minimum in your coating. Thanks for posting your recipe. I’m still on a roll with these! This past weekend I made my friend’s “birthday cake” out of these. I made a strawberry cake with cream cheese frosting and rolled them mainly in white chocolate but also some in milk chocolate (I ran out of white!) and then sprinkled a little bit of pink sugar crystals on top. Then I found some disney princess candles and stuck them in a couple so she would have candles to blow out. So cute!! Next week for a potluck I’m using a devils food cake with triple chocolate fudge frosting (with the mini chips in it) and topping them with a couple mini chips, and also a vanilla cake with vanilla frosting and a bit of peppermint flavor and a dark chocolate coating. Hopefully it will be like a york peppermint patty! bakerella, I made these for halloween and used the Wilton candy melts from Michael’s. While they looked pretty, the coating tasted fake to me. Now I’d like to make a batch for the dessert tray for thanksgiving and I’d like to use melted semisweet chocolate — will that work? I think I tried dipping something (pretzels?) in melted semisweet chips years ago and it was very thick. Have you used the chips for dipping? Will adding a TB of vegetable oil help? ~Miss M~ – man, you’re on a roll. Love the combos. Anonymous – I hear the veg oil will help. I need to try it myself with regular chips. The great thing about candy coating is that it doesn’t melt to the touch. Also, give Mercken’s a try. Their dark chocolate is pretty good. Okay, I have to make these. But no Kroger near me, and nothing in my store called “bark”. Do I buy semisweet chips? Milk chips? Ghirardelli leftovers that are broken up at Trader Joes? 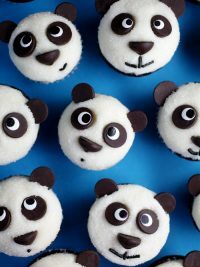 I am going to serve these at my son’s first birthday for sure! Hobby Lobby sells some from make n mold if there is a store near you. Bakers Brand makes a dipping chocolate. It comes in a small tub. But if all those fail, certainly try using the morsels. Add a few drops of veg oil to make it easier to work with. Keep in mind, the melts are made for dipping and are less likely to melt to the touch like the morsels. First off, thanks for all these great recipes — and for replying to everyone’s comments. You rock! They were totally covered when I put them on the wax paper to set. What am I doing wrong? Bark too hot? Balls not cold enough? Something else? Also, some of them started to look a little dull/filmy after they set up. Oh! And a tip for those who are bothered by the “feet” at the bottom — I took a sharp knife and trimmed around the bottom while the chocolate was still warm but starting to firm up. I kept a discard pile and was able to re-heat those pieces instead of wasting it. First of all, thanks for sharing all your fabulous ideas! I loved these cake balls. I made them for a party this week. I used semi-sweet baking squares for a few of them and it was pretty good, just not as good as the bark. Also, I kept my leftovers in the fridge and they seemed to get better every day. Next time, I’ll make them in advance and let them refrigerate for a day. Thanks again for sharing! surly – I’ve had that happen before. I think it’s because, the coating isn’t thick enough in that spot and also if there’s the tiniest opening, the inside can start to push through. If it becomes a problem, just dip them one more time to fix. Kristine – I definitely like them best on the second or third day. And I don’t even refrigerate them. I made these for the first time tonight. I have done lots of work with chocolate coating disc that I buy from a local restaurant supply company. They had some that had a creamy white chocolate flavor. The white chocolate with this flavor just made them soo much better. I also learned a trick with making the balls and getting them to hold together. I bought a cookie dough scooper. I chilled the mix for a bit and scooped it out onto parchment paper and froze them for 1 hour. Then brought them out and rolled into more round firm balls, Then froze them solid. 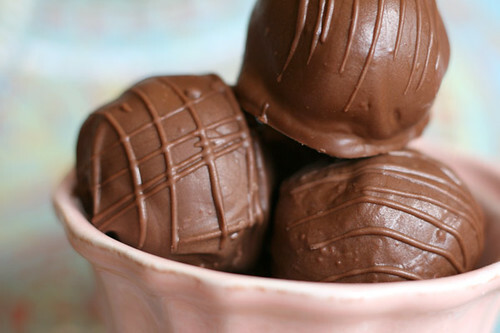 That made coating them with the chocolate a lot easier and they didn’t break apart much at all. Cool, glad you found a fix. I freeze mine too, but I don’t usually use the scooper. To make these for the holidays, would it be possible to color white bark green with food coloring? Or… would it be better to buy the green candy chocolate? Please let me know. I think they would be great holiday gifts this year! LOVE your site. Thanks!! You can color white bark, but you can’t use regular food coloring. You have to find some without water. or you can just buy the green melts. i discovered your site a week or so back & have been addicted ever since. your ideas are amazing! (and you're a perfectionist like me, so your creations are adorable). i made the cake balls & oreo truffles last night. i had to improvise a little with measurements as i am in Australia & we use metric measurements. the oreo balls taste fantastic, but i'm easily impressed with any sugar/chocolate combination! i'm not sure what an 18oz packet of oreos equates to here, so would you have a rough idea of how many biscuits you would use instead? the cake balls probably turned out a little gooier than liked, but still taste ok. i used a chocolate cake mix as we don't have any red velvet mixes over here :( i also made my own 'frosting' (we call it icing), but next time i might use a betty crocker vanilla frosting, which comes in a 16oz quantity. i had a friend suggest pricking either side of the truffles/cake balls with toothpicks & rolling the balls in a tray of chocolate. you can then hover the balls using the toothpicks so you don't form a flat bottom of chocolate after dipping. thanks again for your great ideas. i'm now inspired to do a sports ball theme of cake balls for my little boy's 1st birthday in 19 days… eek. ok, back again. toothpick idea doesn't really work cause the balls are too soft. i will need to give it 2 coats as the chocolate is too thin with just one coat. i want to be able to get these perfect, so i guess i'll just have to keep experimenting. 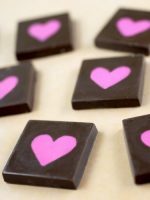 i want to be able to custom make these as well as other chocolate gifts that i will make for local weddings, so i really need a quick, but professional looking method for dipping these. ???? what kind of chocolate are you using? Have you looked for the candy melts too : Mercken’s, Candy maker make n mold, Bakers chocolate makes a dipping chocolate. Also, lay them on wax paper or aluminum foil instead of baking paper. They shouldn’t stick to those. thanks for the reply. i think my measurements worked out pretty spot on for the oreo balls. my husband is cranky that they are lingering around for so long while i perfect this dipping! 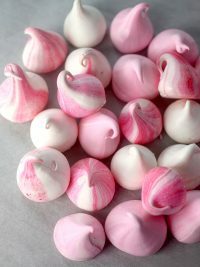 at first i tried ordinary white chocolate to dip then i went out & got some nestle melts, which is a compound chocolate. both i have mixed with a little copha to thin it out. i just don't know anywhere here where i can get the candy coating or dipping chocolate. i see you have the mercken's candy melts available through the amazon store. maybe i should see if i can get some sent over? would these be the best ones to buy? i think i can get the wilton coloured candy melts through ebay, but from memory i think you said these are not great for dipping either. and i will try wax paper. silly me, thought wax paper & baking paper were the same thing. The green melts should work perfectly. Thanks so much. I came across this site via How About Orange (one of my FAVS) and I am addicted. This site has so many great ideas and beautiful photography. 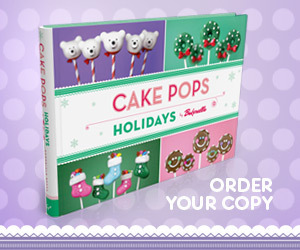 I can’t wait to see the cake pop cookbook. I can already think of 5 people I want to get it for. Thanks again and best of luck with everything! Hope you have a great holiday!